Welcome to the number one page on the web looking at the Key West Climate. The easy thing to say about the place is the climate can only be described as tropical. Although Key West is still part of the mainland of America, it is so far away across the water that it has more in common to the Caribbean. In fact it is only 90 miles away from Cuba, 280 miles from the Bahamas, and amazingly 127 miles from Florida itself. You can take a look at the map of the Key to see how Key West Climate is due purely to the Florida Keys location. So when it comes down to gaining the necessary information on Key West Climate, it is good thing to consider what you would pack if you are considering a trip to other tropical resorts such as Anguilla, the Bahamas or all the other gloriously sandy Caribbean islands? Shorts, sandals, cotton shirts, mosquito repellent, and a nice sun hat....and in Key West it will be just the same. So lets start with looking at the different areas of Key West climate, and breaking them down into sections such as rainfall, temperature, wind speed, daylight hours, hurricanes etc. And really to get a good understanding of the monthly and annual climate changes and averages in Key West, we need to compare with somewhere so for most of the sections looking at Key West climate we will compare with the mainland of Florida. Over the last few years the average precipitation in Key West has been measured at 38.94 inches, which is considerably less than up the road in Florida which records annual rainfall at around 52.43 inches. Being a semi tropical climate you will expect rain, but the island has a distinct two season vibe going on, The rainy season if we are to call it that will be generally from the months of May through to October. Although through these months, it isn't very common to get days of persistent rain. Instead it will be a quick but heavy downpour or a thunderstorm, which breaks the heat, and brings the temperature down which can sometimes be a bit of a relief. Over the last 30 years the rainiest month is September with 5.45 inches, with February being the driest with 1.51 inches or precipitation. One thing to advise if you are a visitor to the area, If you do check in the morning and the local weather states rain, you shouldn't think of changing your plans, as a quick run for cover should leave you with another fine day to explore the southernmost island. Temperatures are about 10 degrees less each day than up on the Mainland of Florida, due to the sea breezes that come of the Gulf Of Mexico and the Atlantic. It makes the Key West Climate extremely appealing, especially in the hot summer months, where if anyone has spent a day walking around one of the Orlando theme parks will know that it is energy sapping. In fact the hottest it has ever registered was way back in 1886 when the thermometers hit 100 degrees. If you want the hottest months to visit then you should aim to enter Key West in August, when the average temperature will be highest. But to be honest there isn't a massive difference throughout the months. Lets separate the months into the four usual seasons of Winter, Spring, Fall, Summer to give you extended information, but as we say you won't see huge peaks and troughs. Winter is more classed as such due more to to the months than the temperatures. For example in most places you would expect to be wrapped up in coats, perhaps shoveling snow from your driveways, but here in Key West short sleeves are still the norm. The average highest temperature in January is 75 degrees Fahrenheit which is not too bad at all. Even in the lowest temperatures are up in the 60’s at around 65 degrees, which makes the Key West climate one to seek out for some rather pleasant Winter days. But even in January, and actually most of the months you can get record highs, with 90 degrees once recorded whilst people elsewhere still taking down their Christmas decorations. Spring is a slight step up in temperature, but only by about four degrees or so. And by the time April ends and we are well on our way through the Spring Months you can expect a temperature at the highest around 82 degrees Fahrenheit. Spring low is about 72 degrees Fahrenheit and for many people me included I would consider Spring to be my favourite time to visit the island. Certainly they are the months where the outside life that the Florida Keys are famous for really have that little extra sparkle. 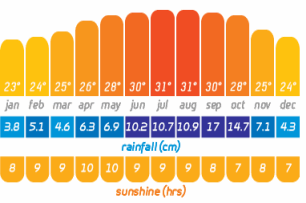 Of course you would expect summer to have the highest temperatures and then do, but the average only goes up about two degrees from the beginning of June to the end of August. You can expect most days in August to be about 90 degrees, but like we said at the top of the page due to the breezes that come of the seas the temperatures are nowhere near as stifling as other parts of the mainland of Florida. One thing that is interesting is unlike most places that get busier and busier in the hot Summer months, the Key West Climate and I suppose throughout the Florida Keys makes the place get quieter as the streets empty out. You see, there is a hurricane season, which we talk about later and so lots of people decide to keep away in Summer, which although they do happen will more often than not happen in August. But still it has never kept me away from the place, and I like these months because the crowds are less, and it just seems a little more relaxed which you want when you are on vacation. However at the end of Summer leading into October we have the huge tourist attraction which is Fantasy Fest, that certainly stops the calm in its tracks, but hey we can't be greedy I suppose and want the place all to ourselves. We could skip talking about the Fall down in the Florida Keys, as it doesn't really occur. Certainly not like the lovely examples across the world, where the leaves change to lovely reds, and browns and then drop like tiny parachutes to the ground. Key West climate leads to a very slight decrease in temperature down to a October high of 85 degrees Fahrenheit, and low of 76. All the way through it is still a nice temperature, which starts to see the crowds returning after the Fantasy Fest madness has departed and the hurricane season finishes in November. Hurricanes do occur in the Florida Keys, and with the Key West climate being tropical you have to expect these destructive forces of nature to occur. The season really is from about June to September, but in all honest you are far more likely statistically to experience one in August and September. This certainly has been the case for the last hundred or so years. For more on Hurricanes, and their history within the Florida Keys, take a look at our great page on Hurricanes in Florida.